A recipe really works for me when everyone (including two toddlers) give Mom the thumbs up at dinner, scarf it down, and then beg for more. This is one of those recipes. It started out as an accident; I bought a can of crushed pineapple instead of chunks, then I didn’t know what to do with it. I looked online and found this chicken recipe, and we really liked it. But then chicken wasn’t on sale for a while and I had a lot of pork chops, so I gave it a try with pork. Oh, my! 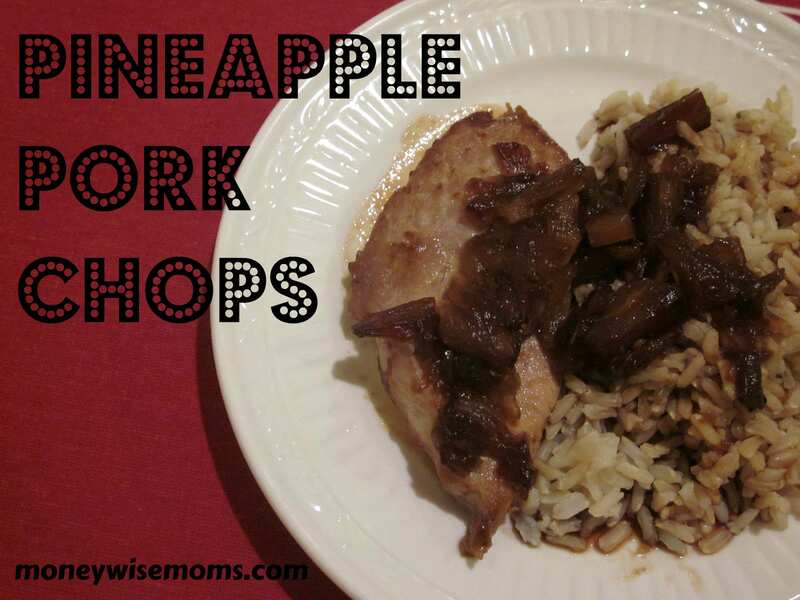 It must be the acid in the pineapple that breaks down the pork, but it comes out so tender and juicy. I’m not usually one for fruit + meat, but I looove this. And my kids looove it, even though there’s a tiny bit of heat to it (the crushed red pepper flakes). I hope you’ll give it a try. It’s quite yummy. I serve mine with brown rice and something green. The juice and pineapple bits from the pan taste great on the rice. Mmmm….healthy and delicious. For more Works for Me Wednesday tips, head over to We Are That Family. For more of my family’s favorite recipes, see my Recipes page. This recipe is also linked to the $5 Dinner Challenge and $5 Dinner’s What to Make When. This looks like a great recipe and I just happen to have pork loin left overs. I'll bet I could jazz it up with this recipe for tonight! Thanks! This looks wonderful. Thanks for sharing. I have started to do dinners for Four people under $10 over at my blog. That is the best when everyone in your family likes a meal. Thanks for sharing this. I just made it with the pork chops. It was yum!